An update to my favourite (as in I wrote every word of Romeo and Juliet: A Novel in it) writing app Ulysses just landed. There are some nice new touches, including the ability to have your sheets open as tabs on Sierra, above. And if you’ve got one of the fancy new MacBooks with a touchbar that’s supported below, too. The full list of changes is below. Just a reminder… I have a cheap little ebook for anyone starting with Ulysses who wants to write a novel. 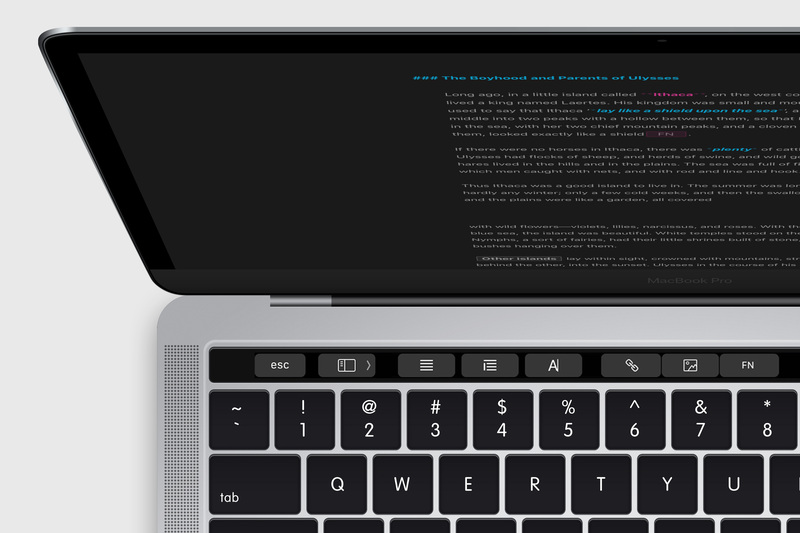 The Touch Bar is the new touch display situated above the keyboard of Apple’s latest MacBook Pro. Replacing the function keys, Touch Bar can adapt to what a user is currently doing, and display app-specific, contextual functions. Ulysses 2.7 allows owners of the latest MacBook Pro to assign markup tags directly via Touch Bar while they write. Users know tabs from their web browser; with macOS Sierra they are now available as a system feature, and they also made it into Ulysses 2.7. Tabs are a natural fit for Ulysses, as the ability to quickly switch between multiple open texts within the same window makes for an even more powerful writing tool. Ulysses’ new version now offers full support for the TextBundle format (http://textbundle.org) outside its iCloud library. TextBundle combines Markdown text files and referenced images in a single file, and users have long wanted Ulysses to properly support the new format. This addition allows them to use images when working from Dropbox or other storage providers. Also, it is now easier than ever to switch from Evernote to Ulysses. Ulysses 2.7 allows to import ENEX files, Evernote’s proprietary export format. Users can even import ENEX files containing multiple notes — Ulysses will then create a separate sheet for each imported note. Writing goals allow Ulysses users to determine the length to achieve when writing a text: a number of characters, words, or pages. With Ulysses 2.7 the feature was extended: users can now even set a reading time goal. Next Why do Romeo and Juliet fall in love?